REINFORCING STEEL IN A ONE-MAN OPERATION. 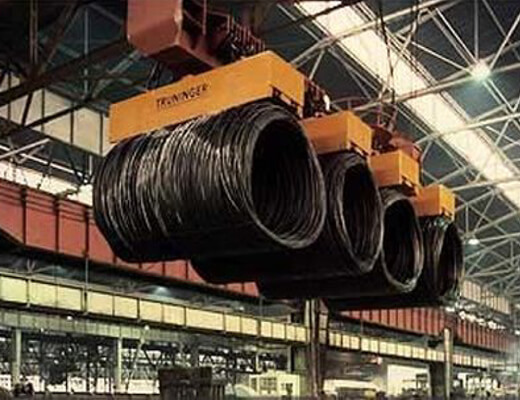 Tightly wound coils of reinforcing steel can be handled magnetically in either horizontal or vertical axis. 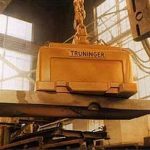 TRUNINGER builds special magnet systems for the handling of all standard categories of reinforcing steel. Lightweight construction, based on honeycomb construction of the spreader beams, reduces the dead weight of these long spreaders. The magnet suspensions have long adjustments, to afford handling of bundles which may not be horizontally level. Bundle irregularities are also accommodated within the suspension system, which enables all magnets to make proper contact with the load. Even stores for extremely long reinforcing bars can be managed by one person with a TRUNINGER magnet system. The personnel involved profit from high productivity and a safe, convenient workplace. No risky climbing over material stacks is required, reducing injuries. Personnel are not required to enter the storage areas. All work can be done from the crane cabin or via remote radio control. 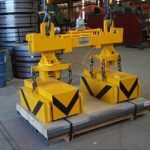 With the specially shaped pole shoes, of a longitudinal magnetic flux magnet, it is possible to move two bundles of reinforcing steel per cycle. Transverse mounted or active swiveling magnets are used for even larger handling capacities.